The insights from the project work are written to give a personal view about the work you did. It is about writing down the insights you got and what new points you gained from reading the whole text of the project work. While the reflection is about the effects the project would reflect to the readers. The project can be any like a book, or any magazine you wrote or even the school or college project. Insights and Reflections for PW – What to Write? It means from somewhere at least you will have to start and that should be the first paragraph of the whole content. The introduction is must and it should contain the reason why there is a need to mention insights and reflection to complete the project work. 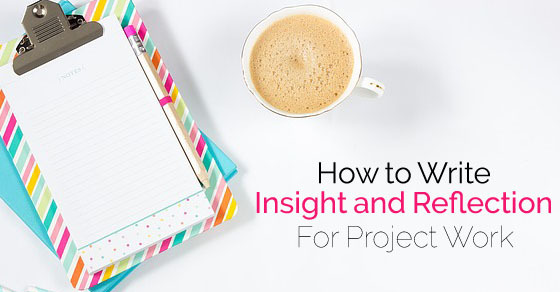 Before writing the insight page, make sure you have a full fledge idea of the work done. Even if you do not have, it is recommended to once go through the whole content to get the rough idea so as to write in the paper. Especially in case of the book, you need to go through the whole content so that nothing goes wrong. Outline the purpose of the paper and also the major points about the story should be written in the insights paper. In the insights, you have to give the personal opinion. That should not be copied from anywhere and should be entirely yours. You have to write about the insight of the opinion you developed while making the project. Write down idioms, the proverbs into the opinion. You can even refer to the quotes of the famous personalities. Make use of the quotes by famous writers, personalities. It creates a great impact and is very influential. Although you have to write your own opinion yet opinion of other authors can also be written in the project work. You can explain a bit about your designation, author’s work experience to make it more professional and trustable. Whatever you write, make sure you pen down in small paragraphs. The paragraphs will help reader go through the content easily and also they will not find difficulty in reading, which otherwise might become difficult for the readers to read the lengthy or essay type content. Also keep in mind to use simple words. The words should not be difficult or complicated, they should be easy to read in a single flow as it will be helpful for all kinds of masses. For writing insights, you need to remember that the views and insights of others who contributed to the project must be given. It is a kind of acknowledgement also and looks grateful to both the readers and the co-authors of the project. While you get opinions and quotes from the other contributors, make sure you also get the signatures of them done to make the quotes authentic, reliable and also to make it patent, if they are extra special to the work they have done. Signatures are not mandatory, but forms an essential part of the insights as it builds trust in the minds of the readers. They come to know that not everything is copied and is unique in its own sense. 8. For reflection paper, what you have gained by participation? You participated with dedication in the project work, you need to tell the readers why you participated and how you gained from the participation in project work. You need to have good communication skills while writing all such things. down what you learned through various scholars papers, tell the readers that you did not believe in what they said; write critically. All the hurdles and the difficulties you have gone through must be mentioned in the reflection and the insight coloumn of the project. It is important to write insights and the reflection on the project as it creates professional look, this is good for you as well as the readers. The difficulties you write becomes a source of motivation to all those who is making projects and to those who is willing to make. Also give solutions to the problems you faced. Insights and the reflection can be written on one page only. If you wish to write them in very long length then make single pages of both individually. Just one or two paragraphs for both the insights and the reflection can make the project look great. Also the readers would like to spend time in reading the project inside rwritingwather than spending much of their time in going through the insights, reflection, synopsis, preface and all such things that forms the initials for the project work. Self reflection is what you think will the project reflect to the readers. Simplicity is the benefits that the readers would get after reading the project work. Self reflection is necessary and vital to make the project credible enough to be believed by the viewers and the readers, especially in the case of the books and other published material. Project reflection is different from the self reflection. The project reflection is entirely about the project itself while the self reflection is the person’s thinking and opinion about the work. Project reflection is also equally important as the self reflection. While writing make sure you do not criticize any author, anyone who worked competitively with you. Just simply give your own opinion and pen down it in a simplistic manner. You should not write something which confuses the reader. This happens only when you are not prepared for what you wish to write. So, better prepare yourself because it really sounds silly when you had enough time to construct the minds of viewers, but you are not able to just due to the lack of writing skills. You need to reflect on exactly what you feel to make readers feel fully satisfied. The repetition of words will let the quality of the project go down and maybe after reading the insights and the reflection, the readers drop the idea of reaching inside of the project work. Other than the repetition, there should be no errors like the grammar mistakes, spelling mistakes, leaving of space etc. should be taken care of. Whatever you write, should be positive and motivating to all those who read your project. There should be nothing that harms the interest of the readers or something which is against the society. Do not write which hurts the sentiments of others. Be to the point and very specific in writing the reflection and the insight. A suggestion to the problems you faced while accomplishing the project must be given to the readers. This should be given in the pointers and not in the paragraphs. The pointers are best caught by the readers and are easy to go through, especially when they have got lots more to read, just like the lengthy project work. Do not make use of complex and uneasy words. Make it very easy and simple to read. There should be no technical word, but even if you have to write anyway, make sure you give the meaning of that technical jargon in the paras. Giving meanings to difficult words help the reader go with a flow and no hurdle. Even if you are writing in paragraphs, make sure you write with a flow and the reader’s time is not wasted by finding rights answers to the mistakes you make while writing. The flow of the writing should continue and there should be no flaw and potholes. You have to give a proper description of everything you write. Do not go essay type, but tell what is the main idea behind the project you made. Do not reveal too much about the project, let readers feel mysterious, so as they can reach deep inside the project to find answers to the questions you left to solve. The reflection should be written in the manner you are writing an introduction, but by keeping in mind that the intro does not give a clear picture of the whole project. The project should be written in a short and precise manner so as just to give a gist of what is there inside the project. The reason why you chose a topic should be explained in a detailed manner. It simply means that you have to point out what benefits your readers can get after reading the project you made. The main reason and the purpose behind the making of the project must be described in the task you took to complete. You need not write essays while you write this column. Just take care of the length and the word limit. The professional work is always sophisticated and looks royal, so you need to do the same to make the project look professional. Apparently, for that, you need to see the length and also the word limit. You can also mention the references while you talk about the reflection and the opinion in the insight column of the project work. The books you made use, the technologies you took help, or anything else like the blogs, the websites, etc must also be written down in this section of the project. By writing all such, the project becomes more authentic for the reader to believe and also the credibility of the project increases. Before you head towards finalizing the project work, make a rough outline of the matter you want to pen down. This way all the flaws will be removed and the work burden will decrease. So, it is better to make an outline for what you think and what you want to write about, what you want readers to know specifically. This way the readers will also fresh while reading and also there will be no confusion. So, above are some of the points that one must keep in mind while writing the insight and the reflection of the project work. Writing such prefaces, the reflection, the insights forms an important part of the project. It reflects professionalism and is a good thing to make the project an utmost success. Whatever you write, write with full dedication and zero flaws, or the project may get rejected with the initial pages of prefaces, insights and the reflection; that you indeed do not want.